According to recent research, around 50% of all eating occasions in the US are snacks, which accounts for about one-third of all adult calorie consumption. That’s a lot of snacks! What constitutes a “good” snack is really up to you, but a definition I like to work with is a small amount of food eaten between meals. It should bridge the gap between full meals, fuel activities, and provide small bursts of energy. When people ask me about healthy snacking, I always say a great goal to have in mind is produce + protein or healthy fats. The combination of produce and protein or fat tends to be satiating since the food will move through your digestive system at a moderate pace, while keeping blood sugar levels stable. Reaching for a sugary snack or simple carbs, on the other hand, can cause your blood sugar to spike then crash, which will wreak havoc on both your appetite and your energy levels. When reaching for a snack, be mindful that the purpose of the snack is to bridge to your next meal, not become a meal in of its self. While our bodies need fuel, we also benefit from giving ourselves a break from constant digestion. With this in mind, when you’re choosing snacks go for snack-sized portions that will fill the hunger gap, yet ensure you’ll still be hungry when the time comes for your next meal. So many snacking occasions happen when we’re tired and hungry, and we have a difficult time controlling both the type of snack (give me sugar!) and the portion size (ALL the sugar!). One of the ways I work around this is to pre-portion snack foods into individual servings. 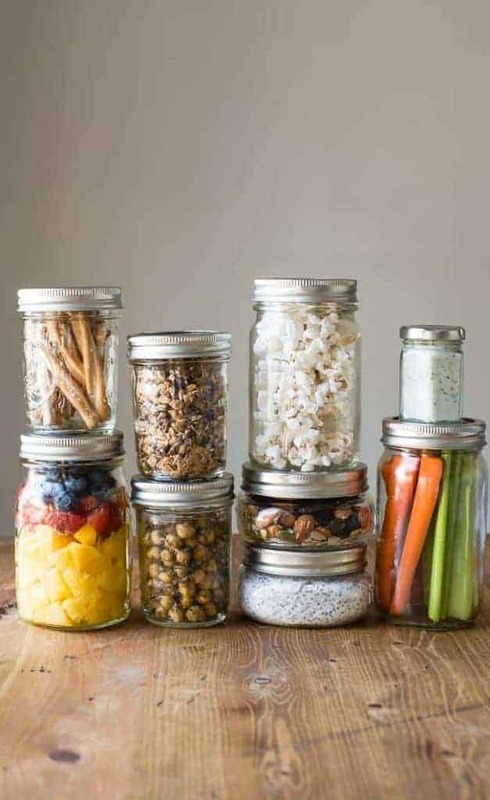 For example, if you buy a big bag of nuts or are bulk shopping, take some time to pre-portion your snacks into single snack-sized servings in small jars or baggies. Before you grab a snack, stop and ask yourself why you’re reaching for it in the first place. Are you actually hungry? Or are you tired? Bored? Lonely? Sad? Having a craving? I know I snack a lot at work when I’m really just looking for an excuse to get up from my desk. If the answer is anything other than true hunger, try replacing the snack with something else, like a quick walk around the block, some simple stretches, or a nice cup of tea. If you’ve done those things and you still want a snack, then have one. If you’re grabbing a snack between the office and your workout class, that snack should follow a different set of parameters than simply bridging the hunger gap between meals. For example, to fuel an after-work swim and get me through from lunch all the way to a late dinner, I often choose a much more energy dense snack than I would otherwise. On the other hand, if I know I’m going straight home to dinner I choose a later snack so I’m hungry for my evening meal. Here’s a system I like to use when choosing my snacks: choose one snack-sized portion of a healthy whole grain carb, one to two snack-sized portions of proteins and healthy fats, and one to two servings of veggies or fruit (this post details what a serving of produce looks like). You can skip the whole grain carbs if you’re not in the mood or if you’re not fueling a workout with your snack and simply stick to protein + produce. We’re eating seeds that have been grown in synthetic soil to make a wheat that’s macerated to flimsy dust, then bleached and chemically treated, a “food” that no other animal will touch. In a 1975 study (5), children who were fed recently irradiated wheat were found to have abnormal cell formation and polyploid lymph, the same type found in patients who were undergoing radiation treatment. A dramatic increase in these cells showed up in blood samples, and because of the potential danger, the study was ended. For verification, the study was continued on both monkeys and rats with the same results. The children, monkeys and rats all returned to normal after the wheat was discontinued. Irradiated food lowers immune resistance, decreases fertility, damages the kidneys, depresses growth rates, and reduces vitamins A, B complex, C, E and K.
On the fruits & vegetables column, portion/quantity is not displayed, does that amount of intake matter or go by the picture? I found this to be a great guide and would love to have it in my kitchen as a reminder to pack my snacks! This is just what I need. Confused though being that I read grains are counter productive to healthy eating as they hinder metabolism. I am thin but also 74 and know my metabolism is slowing even with exercising. Try to incorporate turmeric, cinnamon, chia, flax, etc so snack or meal listings as shown here would also simplify my meals. Thank you for your consideration. Whole grains are a great part of a healthy diet for many people. Some folks swear they feel better when they avoid grains, but others (like me) don’t do well without them in their diet. Aim for whole grains like cooked wheat berries, spelt, brown rice, etc, as opposed to baked goods. Good luck! Such a helpful post, thank you for sharing! I love to snack, so now I know it technically doesn’t always have to be bad! So helpful, thx! I need to post this picture in my kitchen! I am pinning your graphic right now! It’s so helpful. I tend to be under in portion size because I’m paranoid I’m going to eat too much. Then, I end up hungrier than I had intended for later meals. I’ll start working on this now. Thank you for the infographic. I find that portioning is what I struggle with most, ugh.